Today marks the official launch of MetaMoJi Share for Classroom, a real-time collaboration app for teachers and students to interact within the classroom. MetaMoJi today announces the general availability of its Classroom application. This dynamic collaboration environment allows teachers to look over the shoulder of students in real-time interactive class sessions from mobile devices. The Classroom product combines many of the features of MetaMoJi’s award-winning Share and Note infrastructure with the document and user management required for teaching and learning within a classroom setting. 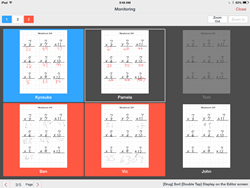 The Classroom product was designed by MetaMoJi to give teachers a powerful tool that is easy to configure and manage documents for distribution, sharing and mark-up. For larger organisations that need centralised management of users and licensing, Classroom provides ICT friendly functions to integrate large numbers of students and faculty. At any time, a teacher can view the current progress of any student in real-time, as they work on a document. If students appear to need assistance or request help from their app, the teacher can see immediately and interact with the students document in real-time, face-to-face or remotely. MetaMoJi Classroom has been designed to manage thousands of concurrent users working on shared documents, on their own work, and even to support online lectures using a view-only mode. The solution is designed to work on-premise, with students in a traditional classroom as well as remotely, with students able to connect with their teachers over the Internet. There is no restriction in where a teacher or student is located: teach in the school classroom during the day, but provide 1:1 assistance to students remotely in off hours. Classroom is available immediately for a free trial or purchase at http://business.metamoji.com/classroom. MetaMoJi Classroom is available in two different versions. The Kickstarter edition is designed to help smaller schools or early-adopters of tablet technology in schools to introduce the application and evaluate its value. Pricing is based on the number of students and teachers in an organization, storage space and any custom support options required. An on-premise version of the product is also available for organisations wishing to install on their own cloud or in their own datacentre.